Above is the schematic. The bridge uses a type of Sontheimer coupler (Sontheimer 1966) and these are commonly poorly designed. The first question is whether the magnetising impedance of T2 which appears in shunt with the load is sufficiently high to not give rise to poor insertion VSWR. If the design seems familiar, ARRL promotes it as Grebenkemper’s Tandem Match, but it is traceable to Sontheimer’s patent. These are also known as Stockton couplers after a more recent author. 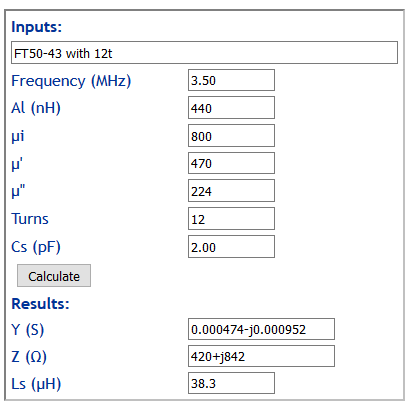 The instructions specify a FT50-43 with 10t for 3.5MHz and up, and 12t for 1.8MHz and up. Experience says these are probably low and worth reviewing. 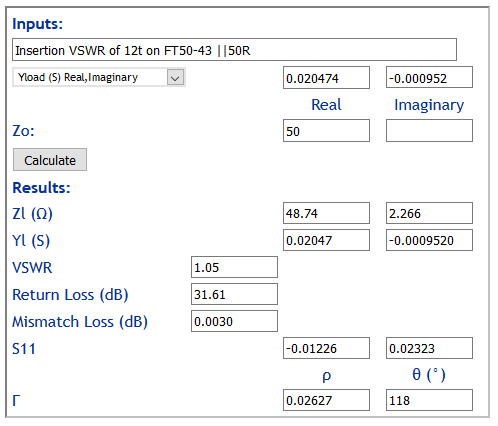 Magnetising Y=0.000474-j0.000952S, lets calculate VSWR with 50Ω in shunt. 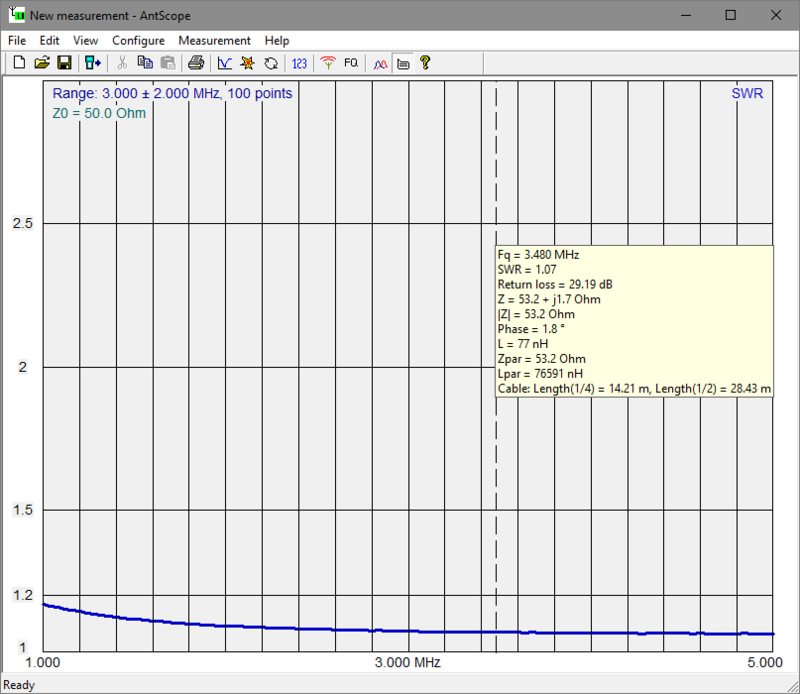 Ok, 12t is barely sufficient for 3.5MHz, and will probably yield InsertionVSWR a little worse than 1.05. The kit was built using 12t. The frequency range is then specified as 1.8-30MHz. Above is a sweep with a Rigexpert AA-600 from 1-5MHz to show the low end InsertionVSWR as magnetising impedance of T2 falls. 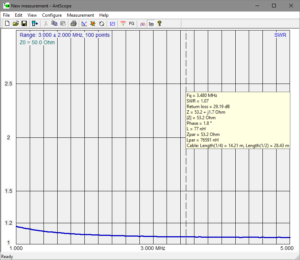 Measured InsertionVSWR is 1.07 @ 3.5MHz. 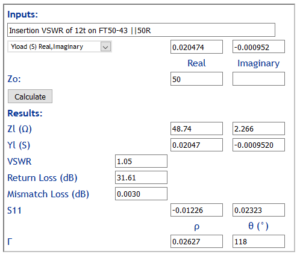 InsertionVSWR at the high end is flat at 1.05 to above 30MHz, and rises a little towards 60MHz. Though it is specified as suitable from 1.8MHz with 12t, InsertionVSWR is 1.10 at 1.8MHz and it really isn’t good until 3.5MHz. The following is a simple circuit analysis under matched conditions, but close enough for all practical purposes. Find Imax R1R2: 51, 0.5W, I2max=(P/R)^0.5=(0.5/51)^0.5=0.099A. Check diode PIV: Vdiode=2^0.5*51*0.099*2=14.28V, well within the PIV rating of the 1N5711. Find main line current I1: I1=n2/n1*I2=0.099*12=1.188A. Calculate maxim input power: Pinmax=I^2*R=1.188^2*50=71W. The manufacturer’s rating of 10W allows a reasonable margin for high VSWR operation. 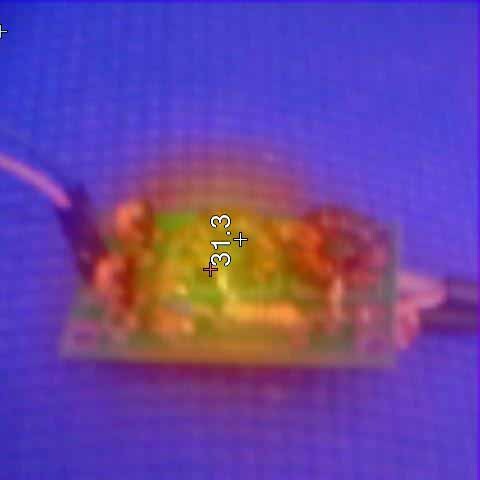 Above is a thermograph after 2min at 10W on 1.8MHz into a matched load, ambient temperature was 21°, so about 10° rise in temperature of the core. By the same method as used earlier we can calculated expected magnetising conductance to be 0.000423S, and core loss with 50Ω load to be approximately 0.000423/0.02043=2.1% or 210mW. 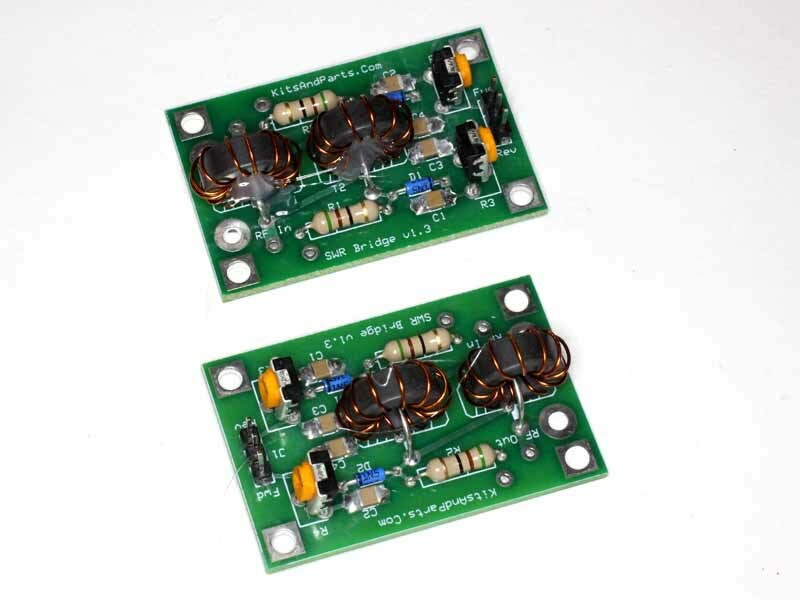 I did use the supplied 1n5711, but on failure I would replace them with 1n34A diodes which are more sensitive at the very low currents used in this circuit.